Late in June two generous visitors to the Shrine made a special stop to help work on the grounds. 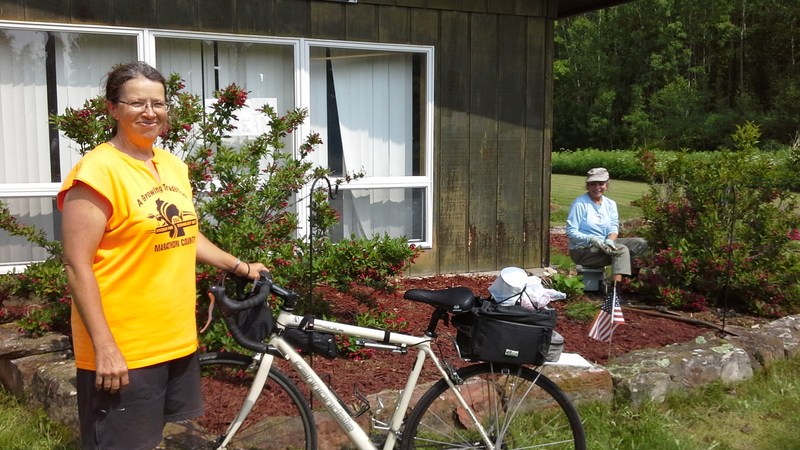 Judy Koenn from Chelsea, Michigan spent a week at the end of June helping Servant Maria inside and out, especially helping to make the grounds look much nicer. Noreen Schreiber biked up from Mosinee, Wisconsin (200 miles!) to visit her son in L’Anse and spent part of her ‘rest’ day weeding our flower garden. Here you see Noreen in the foreground, of course, with her bike and Judy in the background. A few weeks later in July Roland and Theresa Mayer from Ontonagon spent a hot afternoon making ready our rosary path for prayer. Thanks to all those who have helped us this summer! Anyone who is able to help this fall, please feel free to stop… there is always lots to be done!